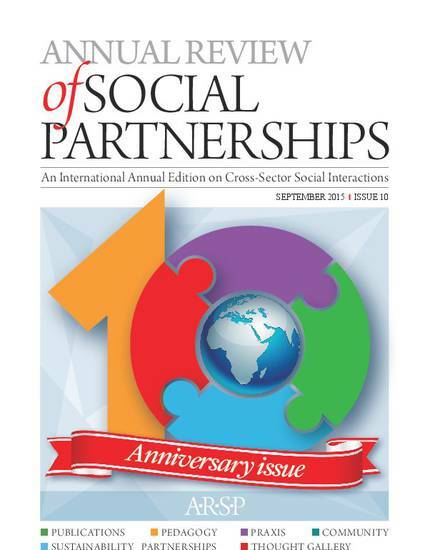 This is the 10th celebratory issue of the Annual Review of Social Partnerships (ARSP) that provides annually the one-stop shop of high quality curated content in cross-sector collaboration research and practice from around the world. In over 100 pages this issue covers: * State of the art review of 100+ new publications on cross-sector partnerships * New tools for designing highly interactive cross-sector collaboration teaching * Academic and practitioner insights through interviews and original contributions * News from the cross-sector collaboration community * Celebratory section on ARSP volunteering, readership and cross-sector inspiration The ARSP is an open access journal and now available through Greenleaf Publishing from: http://www.greenleaf-publishing.com/page2…/Journals/ArspHome The publication is circulated every year to over 50,000 direct recipients, distributed by Ingenta Connect to 1.4 million individual users around the world and by leading universities and institutions for the benefit of all of their stakeholders. The aim of the ARSP is to bring together research and practice in the field of cross-sector collaboration, to communicate high quality collaboration research findings to large audiences around the world, to share best partnership practices, while nurturing the new generation of practice oriented scholars and research informed practitioners in this field.